"This is my favorite Pad Thai creation. After I started making it at home, I could never go back. This is a full meal, suitable for vegetarians and meat-eaters alike. Please enjoy!" Place noodles in a bowl with enough hot water to cover; soak noodles until soft, about 10 minutes. Strain. Combine sugar, water, lime juice, soy sauce, fish sauce, and tamarind in a large saucepan over medium heat. Simmer gently, stirring occasionally, until sauce is slightly thickened, 3 to 5 minutes. Heat peanut oil in a skillet over medium heat. Add garlic; stir just until fragrant, 30 seconds to 1 minute. Add eggs; cook and stir until almost set, 2 to 3 minutes. Add strained noodles to egg mixture; stir in 1/2 of the sauce. Continue to cook and stir noodle mixture until hot, adding additional sauce as desired, 2 to 3 minutes more. Sprinkle paprika and chili powder over the noodles. Layer lettuce on a serving dish or in individual bowls; drizzle with flaxseed oil. 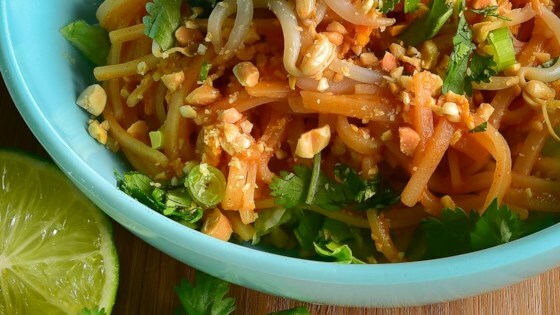 Place noodle mixture on lettuce; garnish with bean sprouts, green onion, cilantro, and peanuts. Serve with lime wedges. Watch a Thai chef make this authentic Thai noodle dish. Fish sauce can be omitted for a vegetarian version. Substitute peanut oil for a mixture of sesame and canola oils, if desired. You can also substitute chives for the green onion and spring mix, spinach, or baby lettuces for the chopped lettuce. The noodles were very good, but with the lettuce and sprouts, it was a very odd combination. Next time, I'd just make the noodles with chicken in it, and serve it hot without the lettuce. Crunchy and delicious. Didn't have flax seed oil so I didn't use, (or miss) it! I was looking for a new pad Thai sauce, so I used just that part of the recipe. It was amazing, perfect for my pad Thai. I tripled the recipe for a full pack of rice noodles. I added an extra tablespoon of soy sauce and a little more chili powder. Great noodle bowl! This was delicious! My noodles should have been softer and it was still good. I also didn't have Tamarind and it was still good. :) yum!